You wanna know the worst cuss word , name calling descriptive you can use on someone you hate? Get ready. The word is Snowflake. It’s not a four letter word . It’s a four letter word plus a five letter word. This is really odd when you stop and think about it. How did such an innocent unassuming word get to be so vile? What once stood for strength and beauty is now the thing of useless dregs of society. Want to bring someone real low? Call them a snowflake. Pendulums swing as pendulums do. Let’s face is it. This is just a pendulum swing, a knee jerk reaction to a generation raised to think of themselves as precious and beautiful. There was a time in this fair land that to be associated with a snowflake was a good thing. Now valedictorians claim the idea is Victorian. You are not special we are told. Nobody is special and you don’t deserve anything. This from a generation (mine and my parents’) who pretty much consumed everything. So there is not as much to go around. This is why they want you to buy the only thing left: the lie that you are not special..in any way. Young people…don’t believe it!! You can be special and not entitled. You do deserve a kind of bestowed dignity by being part of the human race without earning it. *But you can lose it by being an idiot or criminal or both. Now presidents mock you if you think you have basic human rights and call you a snowflake. Snowflakes have no rights, they say. “They think they deserve everything.” Not true. Every human being despite their skin colour, gender, etc deserves love, shelter, acceptance and basic rights. Once you buy into the lie that a snowflake is something that melts in the face of confrontational heat you then open yourself up to bullies, tyrants, rapists (people who chose to not be a snowflake but a stagnant puddle). A snowflake, like a spider’s web, is a strong structure and does what its particular design calls it to do. It is beautiful and unique. Combined, that is unified, with millions of other snowflakes it is a powerful , almost unstoppable, force. I think it’s time to defend snowflakes. I think it’s time for the pendulum to swing back toward the middle just a little bit. *Please don’t read into this that two wrongs make a right. For all you social justice warriors out there this post is not fuel to excuse screaming someone out of their right of free speech or pounding down university doors, etc. In this post I’m going to give you some idea of how I approached creating an ebook from artwork I had created about 20 years ago! The above picture is an actual page from the book with my added copyright. The book was painted on 11 x 17 in. sheets for double spread pages and 8.5 x 11 for normal full pages. This post will not deal with the uploading of images to Kindle book creator. This is fairly easy once you’ve determined the correct size for the pages you upload. Perhaps that will be for another post. The first step , of course, is to write out your story. Once you have your concept you can start to write while keeping in mind possible images that might correlate. You may need to edit words and dialogue when it comes to placing it on your image due to space restrictions. In other words as you draw each page it is important to keep in mind that you will need space for text. Since it was 20 years ago that I created this book I do not have original photos of the process. What I have done is set up pics to give you some idea of how to go about it. 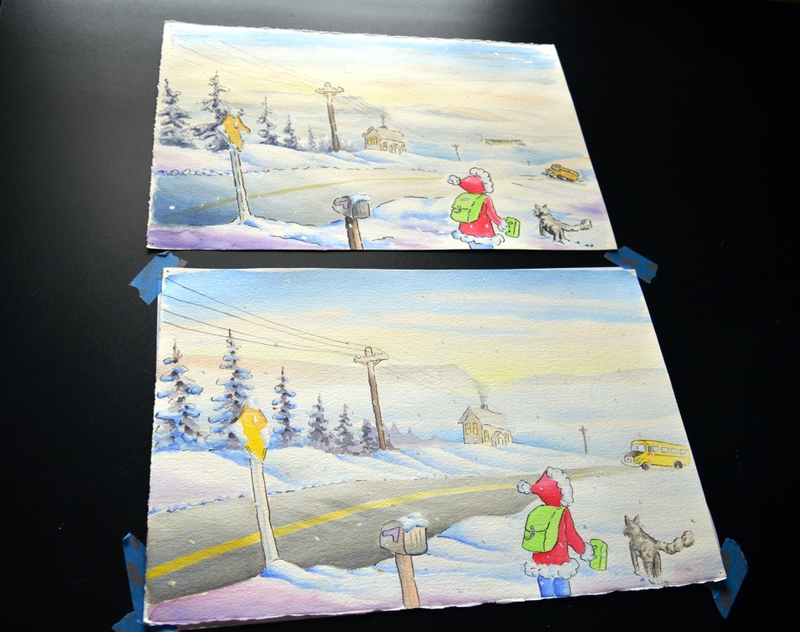 Acrylic wash on cold pressed 140 lb paper was used for the final painting. Tubes of acrlic paint were used and the paint was applied in washes much like that of watercolour. The benefit of acrylic paint is that it can be added in layers without disturbing the original coat of paint ( unlike watercolour ). Begin by cutting your watercolor paper to the required size. Some folks like to pre dampen and stretch the paper to keep it from buckling as it drys. To do this ( I have no pics) you tack or tape your paper to a wooden piece of plywood or better yet a board ( which will have no stains or glues ). You can pour or use a large wash brush to apply generous amounts of water to your paper and let dry. Turn it over if you wish and do the same for the other side. Let the paper dry. 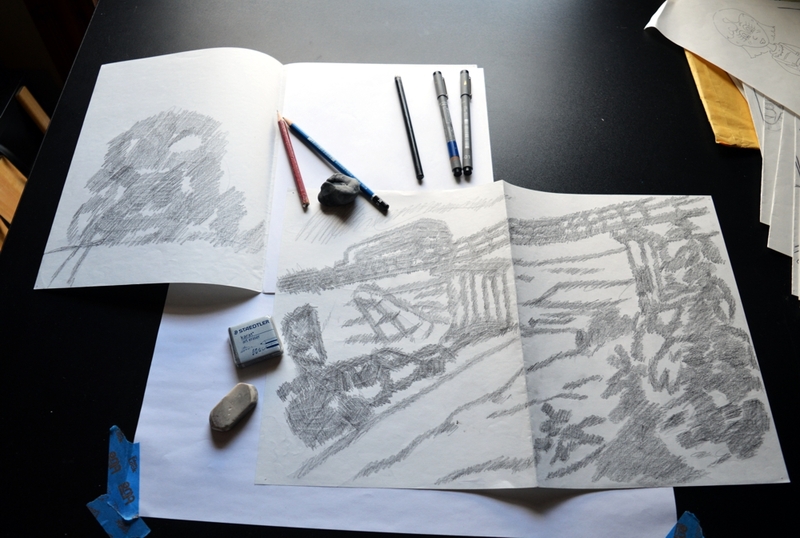 Holding them up to the light by taping them to a well back lit window OR using a light box begin shading in all areas on the reverse side with a 2B ( soft) pencil. You only have to shade areas where there is drawing or lines. You are making a negative transfer as you would use carbon paper ( this dates me I know, ha). 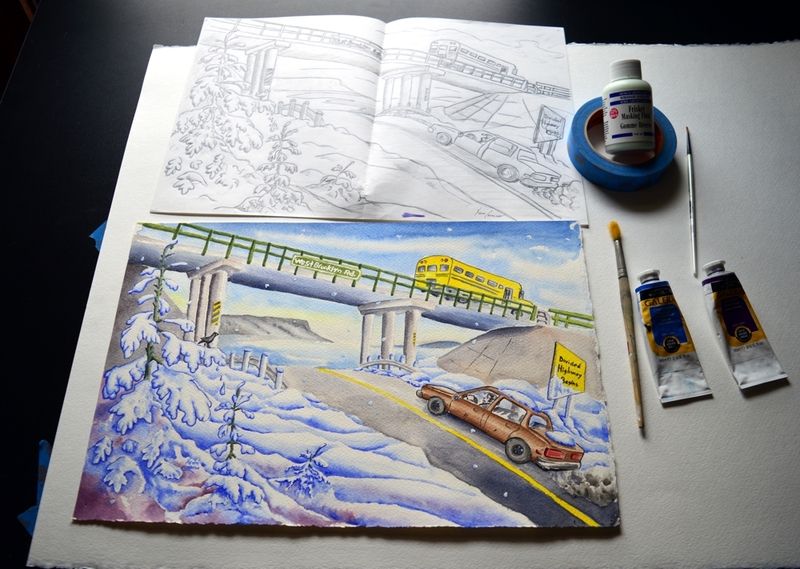 Now place the drawing directly over your watercolor paper. Use some blue low-tack tape to make 2 hinges at the top so you can flip the the drawing page up and down if you need to to see if the transfer is working. But don’t do this often as it could mess up and misalign the drawing. It works like this. Take a dull ( not blunt) F pencil to trace over all your lines. Press down firmly as you trace but not so hard you tear through your paper , of course. 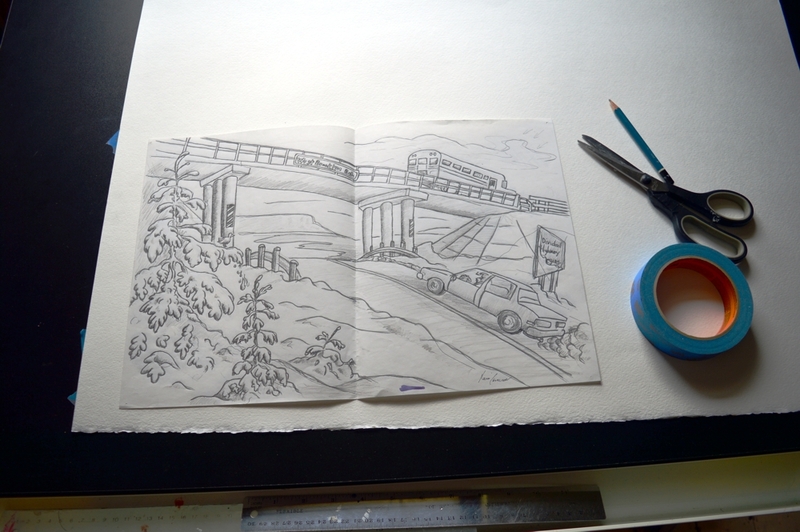 When you are done you will have a light transfer of your drawing onto the watercolour paper. You can now begin painting in your colors using your brushes loaded with thin washes. You may find that a bottle of frisket mask may come in handy if you want to keep highlight areas white; as in snow flakes , for example. The frisket is a liquid rubber that can be painted on or applied to areas you don’t want your paint to color. Wait for it to dry first. Next paint over it. Later with a clean thumb or erasure you can rub it off exposing the paper substrate. You’ll find a convenient tool but not to be overused. Sometimes, as in the painting above, you may find as I did, that you were not pleased with your first result. If so then prepare another sheet of paper and begin again. You may want to shade over your original transfer drawing a little since some of the 2B pencil may be less impressionable after the first use. Savvy? In the drawings above the first attempt (top painting) seemed to come out with harsher gradations. I was more pleased with the bottom result. 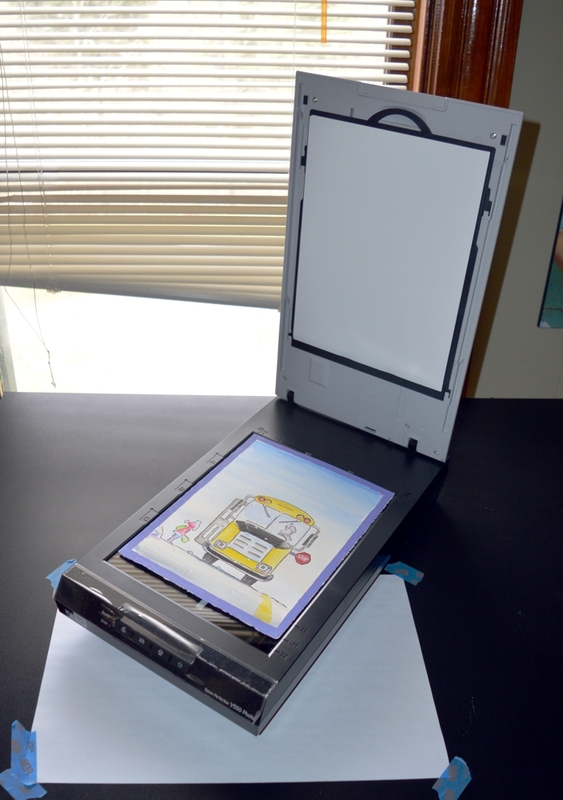 The last step is to acquire a good quality flatbed scanner and and with your photo software scan the paintings into your computer. For the large paintings you can scan as two parts and use your software ( such as Photoshop or PhotoPaint ) to stitch them together. If this part is beyond your level of expertise then find someone who can do it for you. As I said , technology can be rather exciting! A 20 year old Children’s Book has been given new life in the cyber-world. If you’re interested the book is about self worth and it is available from Amazon. The Kindle format is free to download and makes your work look quite beautiful. Again, thanks for stopping by and visit often or drop me a line. Have a great day! Sometimes you can find a new journey on an old path. A new year doesn’t have to mean that everything will be new for you. Something good from last year or other years might find it’s way into this one. You know how we often list off all the crap that happened last year. Debts. Sickness. Accidents and we say good riddance!. Let’s not throw out Father Time with the bath water…er, or something like that. Father Time has a few good things to give Baby New Year. Yeah, I know, it’s a little late in the month to be writing about New Years maybe. Looking ahead may bring anxiety and looking back may get us down in the dumps..yeah, January does that to everybody. You’re not alone. Listen to that still, small voice inside of you that wants things to be better. Reach out to someone. It really doesn’t matter what others think. It’s your life and it’s worth looking back (and forward) to anything or anyone that made it good. Don’t focus on what you didn’t get or the way you thought things should have been. That one good thing is worth living for. An artist does the same with ideas , techniques and inspiration what we all do with our trash. Recycle it. Revisit it. Renew it. Make it come to life! Hey , I’m even thinking of taking up oil painting again after having set aside the ole’ linseed oil for decades. There’s something good in the familiar, ya know. Like the smell of linseed oil. Strong aromas bring back good things and memories sometimes. Don’t dwell on the past though. Think about today. You may find healing in the winter of your life. I hope you do..I really do. 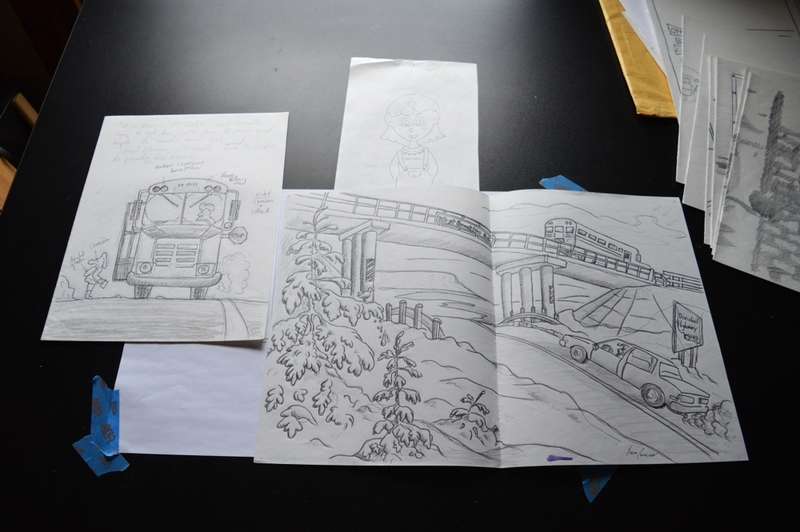 *Detail of Show and Tell Michelle, written and Illustrated by me, Kevin M. Cameron. “20 years in the making”. That’s about right in a funny kind of way. This is a special day . A book which I illustrated and wrote over 20 years ago is now available on Amazon (Kindle). That means that when this book was written my family had no access to the internet at home! The most advanced technology we had was an ancient floor model TV that literally took 20 minutes to warm up. The very first scanned copies were saved on floppy disc which if I remember correctly could only hold up to 1 megabyte of data (?). There’s more to the story at MichelleBook.com if you’d like to check it out. From time-to-time I’ll post how things are going and what I’ve learned about ebook creation for children’s picture books (the things they don’t tell you). In some ways it was easy. I watched lots of youtube videos but I ran into some snags or glitches as I went along. Just a note that since it is a larger file (picture book) it may take a little longer to download but Kindle claims it will do this in the background as you work on your computer. If you go too Google today you will see an homage to Lucy Maud Montgomery or just check out Wikipedia. She was a children’s author from Prince Edward Island ( very close to Nova Scotia where this book is based from). It is her 141st birthday today. This was a totally delightful coincidence as I had planned to write this article today with no knowledge of it being her birthday. Thanks for stopping by and more to follow!